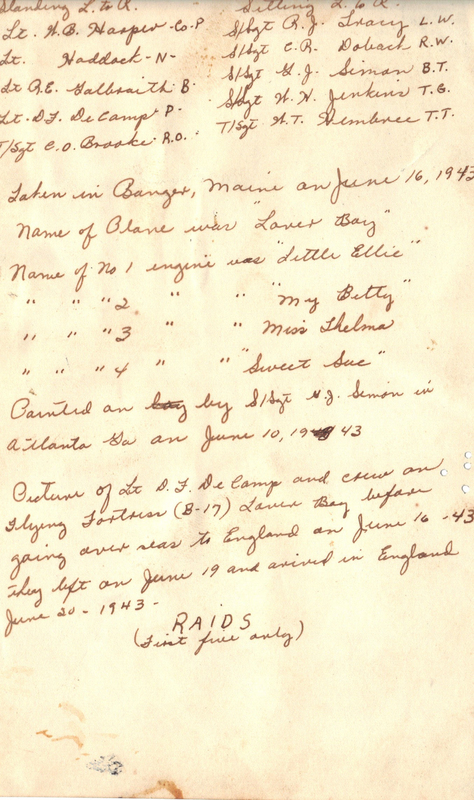 PHOTO NOTES BY S/SGT WILLIAM H. JENKINS: These photos with B-17F #42-30181 LOVER BOY were taken on June 16, 1943 at Bangor, Maine as the DeCamp Crew prepared to leave for England. They departed on June 19 and arrived on June 20. 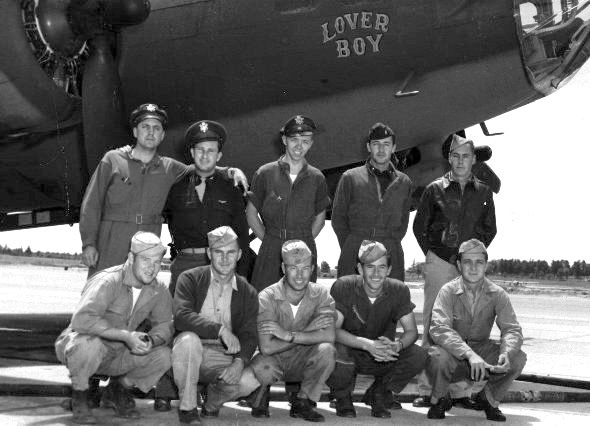 Upon arrival in England, LOVER BOY was assigned to the 95th Bomb Group. The LOVER BOY Nose Art was painted by S/Sgt Gustaf J. Simon in Atlanta, GA on June 10, 1943. Each engine had its name painted on it. No. 1 was LITTLE ELLIE, No. 2 was MY BETTY, No.3 was MISS THELMA, and No. 4, shown in the second photo, was SWEET SUE. 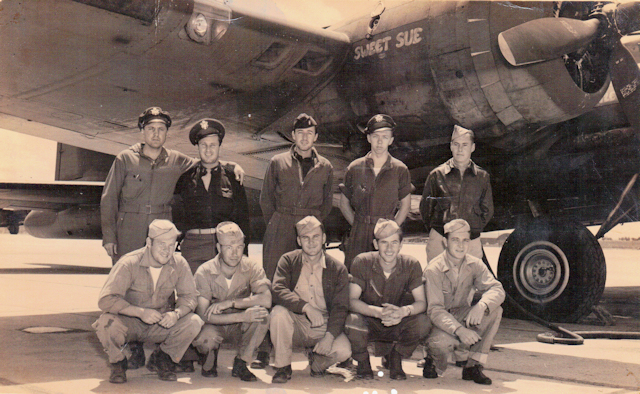 303rd Bomb Group records show S/Sgt Jenkins as flying six missions. Jenkins note on the back of the photo indicates he flew only the first five. He was injured in his left leg by a shell from a waist gun that jammed and misfired while testing the guns over the North Sea. A view of the back of the second photo can be seen here. DeCamp (P) - Flew nine missions as CoPilot on the F/O Elmo E. Clark crew (52, 53, 54, 55, 56, 63, 66, 67, 69). Upgraded from CoPilot to Pilot. Flew sixteen missions as 1st Pilot with six different CoPilots (68, 70, 73, 74, 75, 76, 77, 80, 81, 82, 83, 84, 86, 87, 88, 97) - Seven missions with 2Lt Aubrey L. Emerson as CoPilot. Completed twenty-five mission combat tour on 7 January 1944. Captain DeCamp was CoPilot on the flight to the USA on 20 January 1944 in B-17F #41-24577 Hell's Angels (358th BS) VK-D, following its 48th Mission and subsquent tour of the USA. Harper (CP) - Was killed in action on 20 October 1943 mission #79 to Duren, Germany B-17F #41-24629 (no name) (358BS) while flying as CoPilot on the Lt J.W. Hembry Crew. Simon (TG) - Was killed in action on 24 February 1944 mission #112 to Schweinfurt, Germany in B-17 #42-31239 (no name) (358BS) VK-N while Flying as Ball Turret Gunner with the Lt. Marshall L. Smith Crew. Brooke (R ) - Became a POW on 19 August 1943 mission #61 to Gilze Netherlands in B-17 #42-3192 (G-for-George) (358BS) VK-G while flying as Radio Operator with the 358BS 1Lt J.S. Nix crew. Doback (WG) & Jenkins (TG) - Sixth and last combat mission 24 August 1943. Transferred out of 358th BS on 22 February 1945.